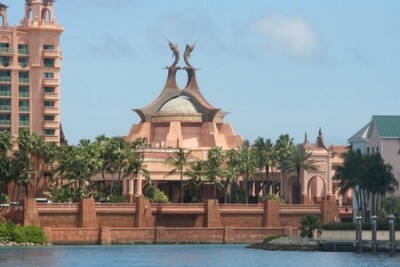 The lost city … Atlantis. It really is like a small self-contained city – tons of shopping, a massive casino, 29 restaurants, multiple huge towers of rooms, pools, etc. I was hoping for a more gradual re-entry into society. This feels like a hard shove. After the solitude and quiet of the Exuma Islands, the mass consumption and commerce makes me want to leave. Our first afternoon here, I tell Matt I’m going to walk the property while he and the boys go to the water park (Aquaventure). I am not quite ready to be among the hordes of visitors yet. When the crew returns to the boat for dinner, I ask him how the water slides were. “There is just enough height and speed to scare the hell out of you,” he says. “You’d love it,” he adds. We all go back the next morning. He’s right – I do love it. Two of the water slides go right through the aquarium with all of the sharks. Some of them are in total darkness so you are dropped into what feels like a 30 mph free fall with no idea what’s coming as you are whipped around curves and sharp turns. One of the water slides is called The Abyss. Enough said. No one except me wants to ride it a second time. We end up staying an extra day because it’s a lot of fun (and, because of where we’re docked, we don’t pay the rates the mega-yachts pay. As Matt says, we’re in the ‘cheap seats’). They even have a library where we spend an afternoon and a huge movie theater where we all see Into the Woods one night. The only photos I take were those while we idled in the channel (I’m sure the Atlantis website has much better ones anyway). The timing of our trip worked out perfectly. We’re told we just missed the last of the spring break rush. The one great disappointment was that the casino had no poker for Matt. He had been looking forward to playing here for months. The first few times he told the boys about this place, he kept calling it the Atlantis Casino instead of Atlantis Resort. He consoled himself with a brownie at Starbucks (the resort also has a Ben & Jerry’s). 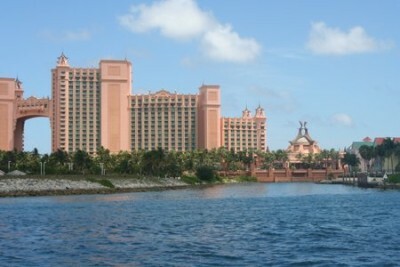 We bid adieu to Atlantis and leave Paradise Island on Wednesday at 7:30 am. Our destination is an anchorage at the Berry Islands. At the beginning of the sail, Matt the Purist makes his appearance. “I want to finish the trip sailing,” he says. The winds are only 6-12 knots (we need at least 15 to move); the sole reason we squeak out 3 knots is we are being carried by current. But at least it’s a calm and relaxing sail. At 1 pm, the ocean floor is 2 ½ miles below us. We each toss a coin overboard and make a secret wish. Joshua asks me mine. I tell him that if I share it, it won’t come true. He begs, then pouts. “Oh, fine,” I finally say. I lean over and whisper in his ear, “I wished that your belly button would get as big as a basketball.” He looks at me horrified. “What?” I ask innocently. “I only wished it for 5 minutes.” He does not look mollified so I finally confess that wasn’t my real wish. He tells me he wished for good luck. By 4 pm it becomes clear we are not going to make our destination before sunset (the destination that would have taken only 6 hours if Matt the Purist hadn’t been onboard). And yes, that comment reflects my attitude for this trek. Matt says he thinks we should go all night and aim for Lucaya, which would have been our destination on the third day. I groan inwardly but agree because there isn’t much choice. This is one of the tough things about this mode of travel. If you’re tired of a car trip, you can pull over and crash at a hotel. On a boat, it’s not like we can anchor in a few hundred (or thousand) feet of water. The trip’s not over until you get to the destination. Sometimes I can be just like the boys … Are we there yet? On this particular leg of the trip, if I had been the captain I would have conducted a (wo)man overboard drill … and then not completed it. The boys are in bed before 8 pm. I’m in bed by 9 pm. I wake up at 10:30 and then again at midnight when I take over for Matt. I am given strict instructions to wake him up if anything happens. The area between Nassau and the northern islands is busy with cargo ships and the cruise ships which mostly travel at night. I’ve been watching one cargo ship on our starboard side. It is the only one that looks like it’s on a collision course with us and I’m hoping the chart will look different in another hour. An hour passes. It’s going twice as fast as us and looks like it’s going to hit us. I call the ship on channel 16 on the handheld VHF to see its intentions. There is no response. I try a few other channels that the cargo ships seem to favor. No answer. It’s getting closer and starting to freak me out. I decide this is a situation for the captain. I go down below and shake Matt awake. He comes up groggily into the cockpit, probably thinking I’m just being paranoid. His eyes widen when he looks at the chart and then looks up to see the approaching ship. He informs me the handheld VHF doesn’t reach unless the other ship is within a mile of us (that sounds like a lot of distance but is not if, based on their speed, you’re going to get hit in 10 minutes). Matt calls on the radio down below and the captain responds. My plan was to ask the captain to pass behind us. I hear Matt ask the captain if he sees us on the chart and what his intentions are. The captain says he’ll pass us on our starboard side (which means he’s going to cut in front of us). The ship gets closer – it looks huge. Matt radios again. The cargo captain tells us to maintain direction and speed. I look at Matt and raise my eyebrows. “We’re a damn sailboat,” I say. “We don’t really have control over the wind.” I tell Matt he should ask the captain to pass behind us. Meanwhile, the cargo ship is getting bigger and closer and brighter. It feels like a scene from a movie. I grab the handheld and say something like, “Listen. We’re a sailboat and are under power by the wind. It’s not that easy for us to maintain speed and direction. Can you just …?” Before I can finish, Matt yanks the handheld from me and tell me I can’t just order someone to do something. “It’s not nautically correct,” he says. Neither, I think, is ramming another boat. The captain again says he’ll pass us on our starboard side. Neither of us is happy about this. We hold our breath as the ship looms over us. At the last second, Matt steers hard to port. The cargo ship passes a mere 50 yards off our bow. I let out a sigh of relief. Playing chicken is more fun when you’re the big guy. We’re both a little shaken. Once the danger has passed and the drama is over, Matt says, “Well that sucked.” “It depends on how you look at it,” I reply. “As a nautical maneuver, yes; as an adventure, I’d rate it pretty highly.” He gives me a look. “I don’t need adventure at 2 in the morning,” he says. Point taken. He goes back to bed and I continue my watch, hoping the rest of it will be uneventful. This entry was posted in Uncategorized on April 18, 2015 by Diane.